how’s your day? It’s corny but I am going to say it anyway: TGIF!!!!! Happy Friday! Hello freedom. A praise for the weekend! Yesterday evening I was celebrating a belated Mother’s Day with my mother and sister. We had a really nice evening together at a typical Bavarian restaurant and I had a phenomenal Schnitzel with fries. I can’t remember the last time I ate such an amount of food on my own! It was so good! I could have bathed in it! Thanks for your advice regarding the undereating trap yesterday. The problem might have solved itself as I am so hungry since yesterday evening I could eat huge amounts of everything anytime. Luckily my favorite fruits are back in the stores so I can just dig right into the yummyness! 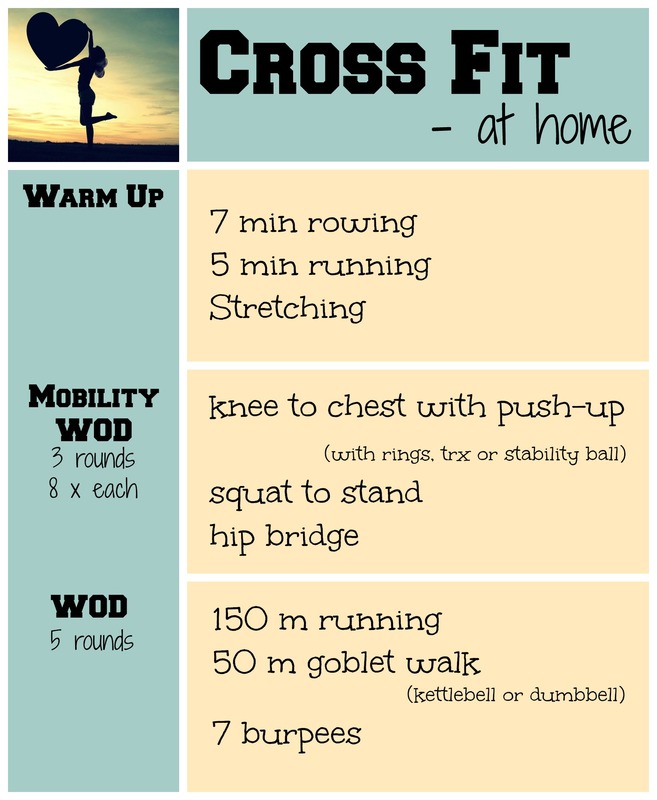 So but for today I though I am going to share a Crossfit Workout with you that you cn totally do at home. Many of you expressed some interest in trying Crossfit but also said that getting a boy membership is pretty expensive. So I thought you could be interested in getting into Crossfit at home. All you need is a set of dumbbells or better a kettlebell and a stability ball. I reckon most of you have this stuff on hand. Or at least can do this workout at the normal gym. Don’t forget to cool down. Hope you enjoy! My abs are huuuuurting!!!! But I felt warm and happy and sweaty afterwards. Best post-workout feeling ever! So for today I have a workshop at 2 pm and then after that I am going to spend a nice and relaxing weekend. Today is Soccer practice, tomorrow rest day with having friends over for BBQ tomorrow evening. And on Sunday we have a match. Pretty amazing. And we have a chance of promising 25°C next week. Summer is finally arriving!!! My mood is indestructible today! The cynic in me wants to kick myself! Help any last-minute gift ideas? My best man turned 30 two days ago and I see him tomorrow???? Wow, what a great workout for something to do at home- and the Daria meme…Man that is the best show ever. Hmmm gift ideas- don’t do the boring alcohol or a tie…maybe make something yummy ha? NO COLOGNE OR AFTERSHAVE. A massage makes a great gift. I want to see your new hair cut. Oh yes, a massage is always a great gift. Unfortunately not for him. I doesn’t like to be touched! After 15 years of friendship he is still slightly uncomfortable when I hug him! Silly boy!